The sound of Desi Hip Hop has leveled up in a massive way in the past few years. Indian emcees have gone from rapping to internet beats using just normal headphone mics to making international level music and gaining massive standalone fan followings all on their own terms. The potential for any rap artist to reach his or her fans is huge and this is due to the collective efforts of a stream of artists who maintained the essence and spread the knowledge about hip-hop culture. The new wave has started, and we also get to see a great uprising in the near future with emerging artists generating high quality sounds. In their latest collaboration, D’evil and Dee MC have dropped two flaming verses along with Shah Rule (who has done the hook). “Smoke” is a song that is essentially dedicated to all the female smokers. The stigma that female smokers receive when they go buy cigarettes or smoke in public is usually higher than their male counterparts. This song drops light on that topic and tells people to mind their own business. It tells people to let people be. Shah Rule drops a grand, melodic hook to the song which bridges both the other emcees verses. Dee MC starts off the song with fire bars and sheds light on her experiences. D’evil also adds a satirical, humorous flavor to the song on the next verse. The song is a certified club banger and is on par with the level of international quality. The amazing visuals of the track are provided by Canfuse. A team that never fail to deliver on quality content and enticing visuals. 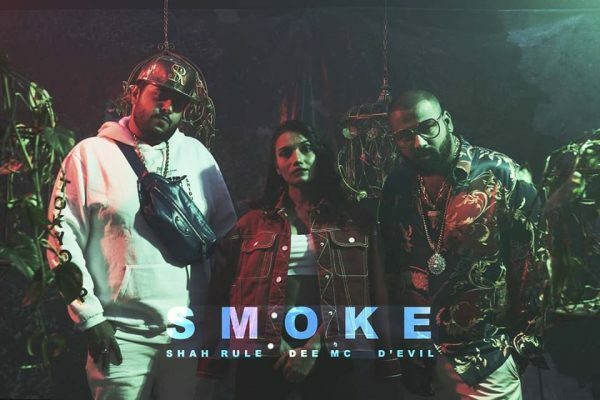 Watch the video for “Shah Rule -x- Dee MC -x- D’evil – Smoke” down below and share the word! Presented to you by Desi Hip-Hop!